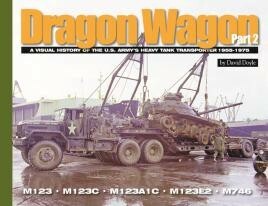 Dragon Wagon is the second in a series of titles covering the U.S. Army's Heavy Tank Transporters. The first volume covered the M25/M26 Pacific family of vehicles and trailers during their service in WWII and Korea. Part 2 picks up the story with the successor to the Pacific; the magnificent 10-ton M123 tractor. The unarmored M123 soldiered on through the 1950s and Vietnam while paired with the modernized M15A1 and M15A2 trailers from WWII. It was also paired with the next generation of heavy trailers, the M747. Also covered is the rare and unusual M746 tractor with service pictures of its brief career. Photo coverage includes lavish color shots of the M123 in Vietnam, as well during development and testing. This is another of the excellent series of landscape format soft-cover books by Ampersand Publishing...If you have an interest in these Cold War trucks I am sure you will like this one. If Prime-Movers are your thing, this book makes a natural bridge between the WWII Dragon Wagon and the M911 HET, bring you nearly up-to-date with the US Army's heavy lifters. Highly recommended. This will prove to be an excellent reference book for all enthusiasts, and is thoroughly recommended. If you have Tank Workshop's 1:35 kit of the mighty M123AC1 tractor unit and need some further references for your build - wiring, colours, markings etc - then this new photo-reference title from David Doyle will prove to be completely invaluable. Another excellent title and highly recommended. It's the Vietnam images that sell this book to me…they capture the heat, dust and mud of the Vietnam War.